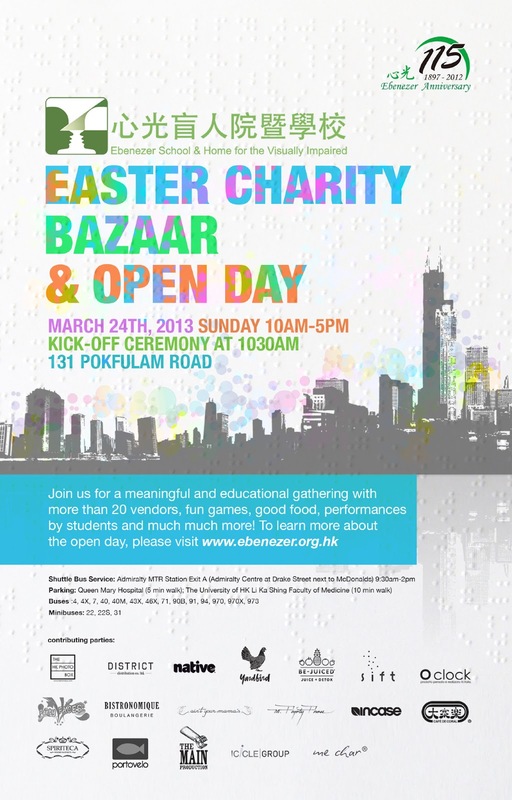 Stop by this charity bazaar to benefit Ebenezer, a school for the blind. Expect lots of cute and hip vendors around -- not your typical cross-stitched bookmarks made by prisoners, or lame cookies by your mom (just kidding, I love baked goods by anyone), or Christmas cards with weird things drawn by underprivileged children that you buy so you can feel good about yourself and then dump in a drawer at home. Oh, and handmade jewellery made from seashells and positive thoughts. None of that. What will be on is food by Yardbird (now we have your attention), juices by detox-brand Bejuiced, gluten-free baked goods by Ain't Yo Mama, gluten-full baked goods by Bistronomique Boulangerie, hipster gear like Happy Socks and OClock watches and Incase phone cases from District Showroom, a balloon-making stand (huh? ), footwear by Portevelo (the new Toms), vintage and secondhand clothing and more. And DIY finger puppets! Because everyone always asks us where you can make your own finger puppets, and now I know where to tell them to go. Sadly I won't be here (okay not sadly, because I'll be on holiday in New York), but you guys go nutso, and for a good cause. Who cares about Rugby Sevens anyway?